You know writing is tough. It doesn’t come automatically for every kid and for some special needs kids, it doesn’t happen at all. My daughter lacks the fine motor ability to be able to form letters, but she loves talking about the alphabet, practicing with her beautiful scribbles and then “reading” what she wrote. Sometimes those kids and even young learners, need to be able to ‘write’ without a pencil. 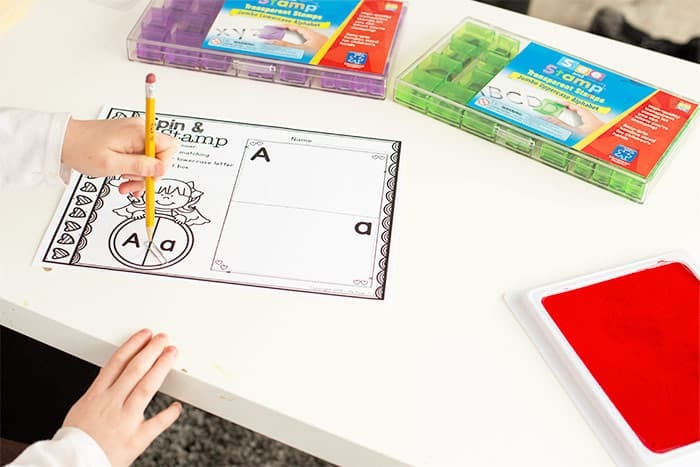 Using alphabet stamps for ‘writing’ is a great way to give those kids exposure to the letters of the alphabet without frustrating them because they don’t have the necessary motor skills. 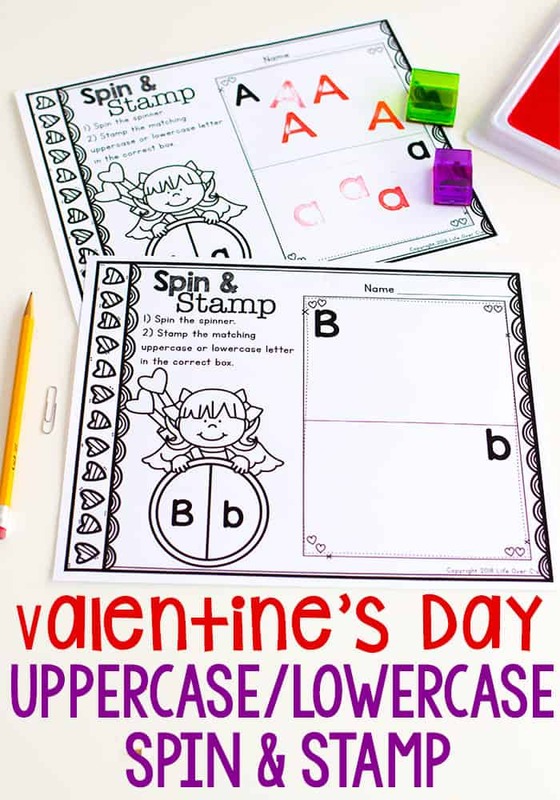 This Valentines Spin and Stamp Letter Recognition printable for preschool is a great way for kids to learn uppercase and lowercase letters while also empowering them with a new way to “write”. 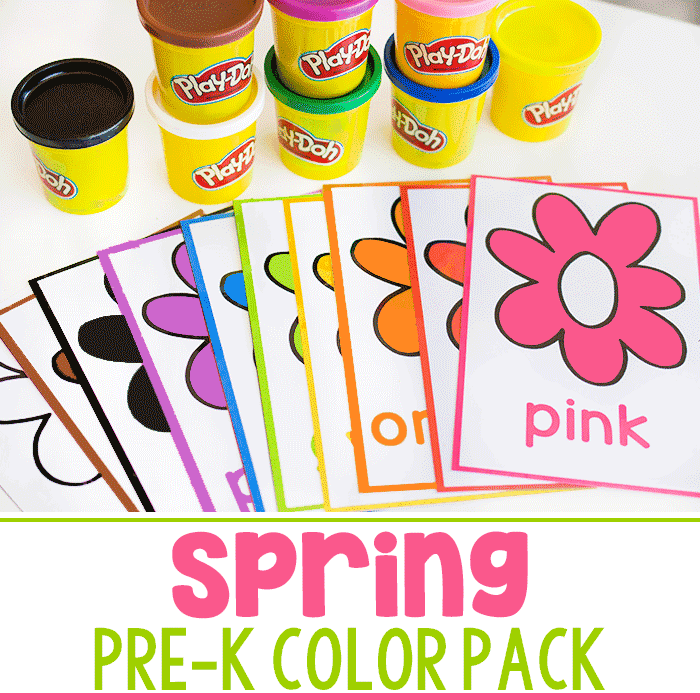 The prep for this activity is so simple. The first thing I do is print out each letter mat. Even if I don’t plan to use every page that day, it is nice to have ready when I need an activity quickly. You can print on either traditional paper or cardstock. To create a spinner, place a paper clip around the tip of the pencil as shown above. 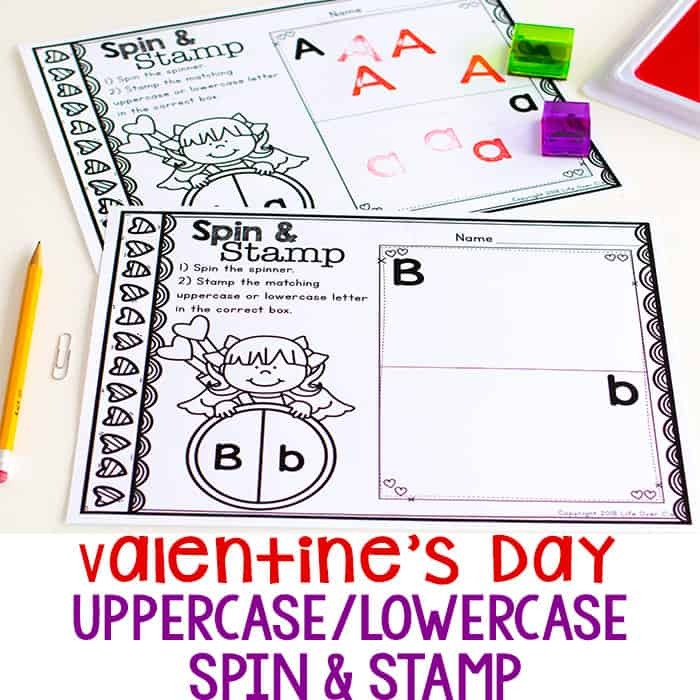 Grab the uppercase and lowercase stamps and a great ink pad and let’s play. 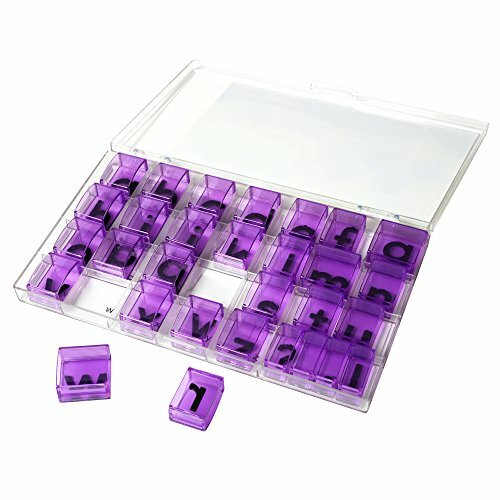 Playing with this game is just as simple as the prep. Kids can hold the pencil down and use their finger to flick the paperclip and it will spin. Then have the kids stamp the uppercase or lowercase letter that was spun. 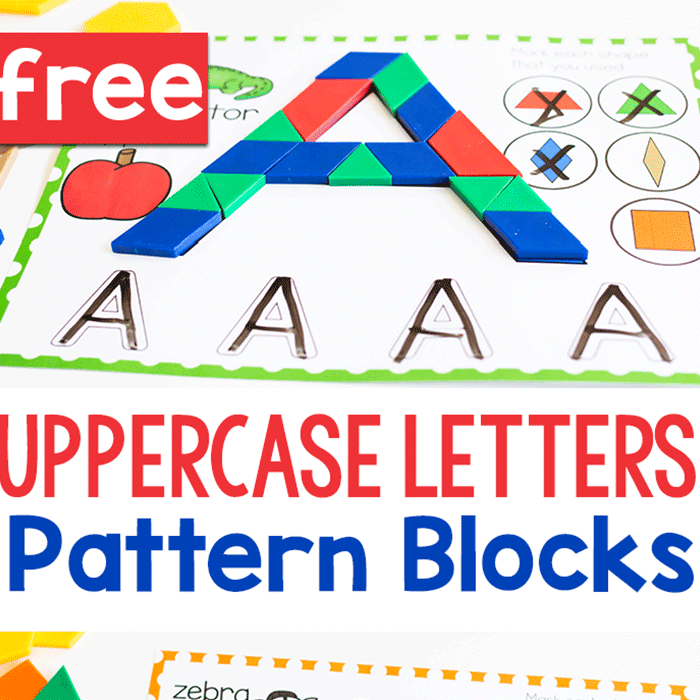 We love these kid-sized alphabet stamps because they are super easy for the kids to hold and see what they are stamping. 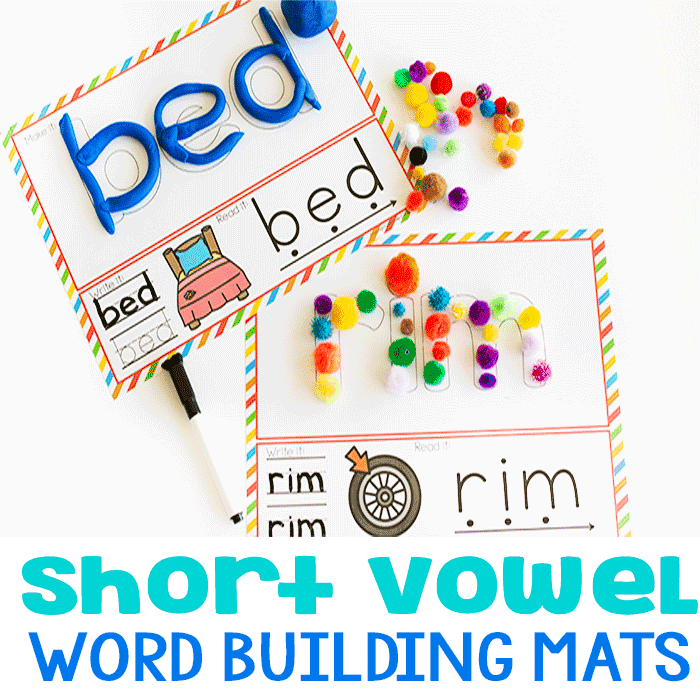 If your child is working on sight words, this would be an excellent canvas for practicing sight words. 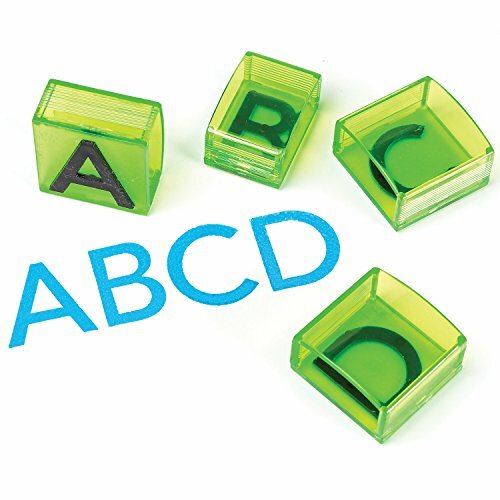 Instead of the child only stamping the letters, the child can choose sight words that begin with that letter. The upper and lowercase can still be honored.